AMMONNEWS - US Secretary of State Mike Pompeo has blasted Iran's religious leaders as "hypocritical holy men" whom he says are more interested in lining their pockets and spreading hardline views abroad than helping out their own cash-strapped citizens. Pompeo's speech on Sunday came as US President Donald Trump and his Iranian counterpart Hassan Rouhani traded angry threats amid rising tensions between the two countries. 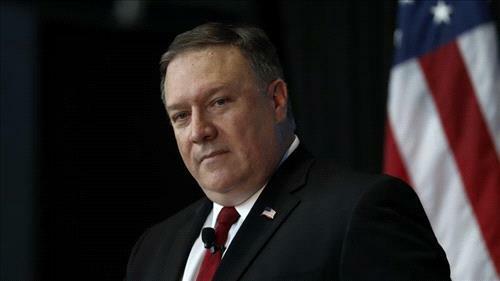 "Sometimes it seems the world has become desensitised to the regime's authoritarianism at home and its campaigns of violence abroad, but the proud Iranian people are not staying silent about their government's many abuses," Pompeo told a crowd of Iranian Americans during a speech at the Ronald Reagan Presidential Library and Museum in Simi Valley, California. "The United States under President Trump will not stay silent," he said in an address aimed at members of southern California's 250,000-strong Iranian-American community. Pompeo took particular aim at several of Iran's judicial, military and political leaders, accusing them of widespread corruption. "The level of corruption and wealth among Iranian leaders shows that Iran is run by something that resembles the mafia more than a government," Pompeo said. The top US diplomat claimed that Iranian Supreme Leader Ayatollah Ali Khamenei had an off-the-books hedge fund, Setad, worth $95bn, and that Iran's judiciary chief Sadeq Larijani was worth $300m after wiring public funds to his own accounts. Pompeo's speech came as the war of words between Rouhani and Trump intensified. Prior to Pompeo's speech on Sunday, Iranian President Hasan Rouhani warned Trump not to escalate tensions with Iran, saying a confrontation with Iran would be the "mother of all wars". "Do not play with the lion's tail or else you will regret it," Rouhani said in a televised speech in Iran's capital Tehran. Trump hit back shortly after Pompeo's speech in a tweet directed specifically at Rouhani. "NEVER, EVER THREATEN THE UNITED STATES AGAIN OR YOU WILL SUFFER CONSEQUENCES THE LIKES OF WHICH FEW THROUGHOUT HISTORY HAVE EVER SUFFERED BEFORE," the US president said. Pompeo and US national security adviser, John Bolton, have used combative rhetoric against Iran since Trump withdrew on May 8 from the 2015 deal to stop Iran from developing nuclear weapons. Rouhani had hinted earlier this month that Iran may block regional oil exports if its own sales are halted following the US withdrawal from the nuclear deal. In his Sunday address, Pompeo said Iran has seen its "most enduring protests" since the revolution these past eight months as Iranians demonstrate against state spending on military activity in Syria, Lebanon, Yemen and elsewhere. "The specific grievances differ," Pompeo said in his address. "But all those voicing dissatisfaction share one thing: they have been ill-treated by a revolutionary regime. Iranians want to be governed with dignity, accountability and respect." The US secretary of state added: "While it is ultimately up to the Iranian people to determine the direction of their country, the United States ... will support the long-ignored voice of the Iranian people." While some Iranian Americans say Washington should back anti-government groups in Iran, others say heavy-handed tactics could backfire and call for a less confrontational approach. Trita Parsi, founder and president of the lobby group National Iranian American Council, said Pompeo's tough talk could fuel grievances, destabilise Iran and set Tehran and Washington on a collision course. "Criticism of the corruption of the Iranian government is not only often times accurate but also something that a lot of Iranians would agree with," Parsi told Al Jazeera. "But the step from there to think that the Trump administration - that currently is undermining democracy in the United States - is the answer to Iran's lack of democracy, is a major leap of faith that I don't think most people would take." Roozbeh Farahanipour, 47, an anti-regime dissident who left Iran for the US in 1999 and advocates for the overthrow of the country's religious leaders, was in the audience on Sunday and said that he thought Pompeo was trying to strong-arm Tehran. "Pompeo is trying to pressure Iran to come to the negotiation table for a deal," Farahanipour told Al Jazeera. "The US is not interested in regime change and it is not really interested in improving human rights for Iranians," he added. "The decision for regime change is one that should come from the people of Iran, and they will decide to do this, whether it comes sooner or later." Pompeo and his colleagues say they do not seek regime change and just want to alter Tehran's behaviour. Speaking on a recent conference call with journalists, a senior State Department official said the US wanted to deter Tehran from developing nuclear and ballistic weapons and supporting terrorism. "This strategy is not all sticks," said the official, who spoke on the condition that his or her name not be used. "We have presented a very positive vision for the future of US-Iranian relations … it's a choice that the regime needs to make," the official added. "We have put on the table the possibility of a treaty relationship with the United States if Iran decides to change its behaviour and to start behaving like a normal country." Iranian Americans typically express a range of views on US policy towards Iran. According to an opinion survey by the research group, the Public Affairs Alliance of Iranian Americans (PAAIA), one percent of the 402 respondents backed Iran's mullah-run system in 2017, while eight percent wanted it reformed. Some 55 percent of Iranian Americans favoured a secular democratic government and 11 percent sought the return of a constitutional monarch. While 55 percent of Iranian Americans wanted Washington to work to advance democracy and civil rights in Iran, they were more divided on how a US administration should go about achieving this. Soft power and cultural outreach were relatively popular (37 percent approval), but tougher measures garnered less support. Eight percent of respondents wanted to see tighter sanctions on Iran or wanted Washington to back anti-regime figures in Iran, while seven percent wanted the US to boost support for regional US allies like Israel and Saudi Arabia. Washington has long called Iran the world's leading "state sponsor of terrorism" because Tehran arms and funds proxy armed groups like the Lebanese Hezbollah group. Iranian leaders reject US claims about developing nuclear weapons and supporting terrorism.